This is the second cookie that I baked for my sister’s fencing competition. In terms of taste, I was a little bit selfish – the coconut in the previous cookie was for her, and the peanut butter in these was for me. Really, it’s a continuation of my peanut butter obsession from a few weeks ago. 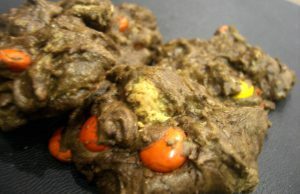 This is a basic soft chocolate cookie, with the added bonus of some Reese’s Pieces and Reese’s Peanut Butter Cups, and some Peanut Butter chips. Exciting, right? I was specifically craving the type of peanut butter that is at the center of Reese’s Cups. 1. Preheat the oven to 375oF. Line 2 large baking sheets with parchment paper. 2. In a double boiler over gently simmering water, melt the semi-sweet and unsweetened chocolate together with the butter. Stir until smooth, and set aside to cool for about 5 minutes. 3. In a large bowl, beat together the chocolate mixture and the sugar on medium-high speed until well-mixed, about 3 minutes. Add the eggs, and mix until completely combined. Then beat in the vanilla. 4. Add the flour and beat until just incorporated. Stir in the Reese’s Pieces, Peanut Butter Cups and peanut butter chips. 5. Drop the dough by tablespoon onto the prepared baking sheets. Bake for 11 to 13 minutes and transfer to a wire rack to cool completely.